January Current Affairs. 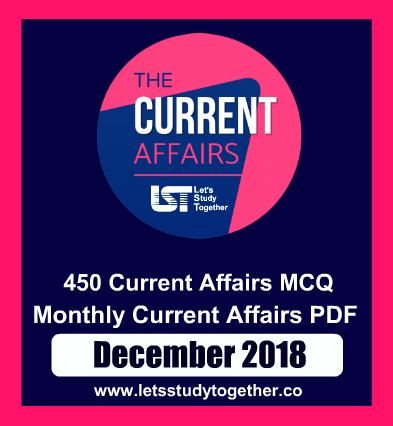 Important Current Affairs Questions – 22nd January 2019. Daily Important Current Affairs. Daily Current Affairs PDF. Welcome to the www.letsstudytogether.co online Current Affairs section. If you are preparing for IBPS PO/Clerk, Canara Bank PO, banking & Insurance, SSC , Railways and other competitive exams, you will come across a section on the Current Affairs. Here we are providing you “Important G.K. & Current Affairs Questions “ in PDF format based on the current events for your daily practice. 1.____________ has been recently appointed as the new chairman of the Council for Leather Exports. Explanation: The Council for Leather Exports (CLE) said P R Aqeel Ahmed has been appointed as its new chairman. The new vice-chairman will be Sanjay Leekha, the CLE said in a statement. The council is a trade promotion orgnisation of leather and leather products industry. It works under the aegis of Ministry of Commerce and Industry. Over 10 lakh people are employed in the leather industry. India’s share in global leather exports and imports is about 3 per cent. 2. Who has been recently presented with the prestigious Rosa Park Trailblazer award? 3. ___________ has launched a rocket carrying a satellite capable of delivering an artificial meteor shower into the Earth’s atmosphere. Explanation:Japan‘s space agency has launched a rocket carrying a satellite capable of delivering an artificial meteor showerinto the Earth’s atmosphere. The Epsilon-4 rocket lifted off from the JAXA Uchinoura Space Center, carrying the first of two micro-satellites built by Tokyo-based startup Astro Live Experiences (ALE). 4.Who will return to his role as Swedish prime minister, leading a Social Democrat-Green Party coalition? Explanation: Social Democrat leader Stefan Löfven will return to his role as Swedish prime minister, leading a Social Democrat-Green Party coalition after parliament voted on the proposal. 5. Uffizi Gallery, sometimes seen in the news, is in which among the following countries? Explanation: The Uffizi Gallery is a prominent art museum located adjacent to the Piazza della Signoria in the Historic Centre of Florence in the region of Tuscany, Italy. One of the most important Italian museums and the most visited, it is also one of the largest and best known in the world and holds a collection of priceless works, particularly from the period of the Italian Renaissance. 6. The Volga is the longest river in which among the following continents? Explanation: The Volga is the longest river in Europe. It is also Europe’s largest river in terms of discharge and drainage basin. The river flows through central Russia and into the Caspian Sea, and is widely regarded as the national river of Russia. Eleven of the twenty largest cities of Russia, including the capital, Moscow, are located in the Volga’s drainage basin. 7. Foreign reinsurance companies have mobilised Rs ________ premium in 2017-18, their first full year of operations in India. Explanation: Foreign reinsurance companies have mobilised Rs 6,216 crore premium in 2017-18, their first full year of operations in India. Out of nine foreign reinsurers, Swiss Re — the second largest global reinsurer — has the largest share of Rs 2,047 crore, while Munich based Munich Re and Paris-based SCOR SE have reported Rs 1,307 crore and Rs 1,186 crore of premium, respectively. During the year 2017-18, foreign reinsurance branches infused assigned capital of Rs 1,452.54 crore, Insurance Regulatory and Development Authority of India (IRDAI) said. Foreign reinsurers had recently asked the IRDAI to scrap the practice of giving first preference to public sector GIC Re for any reinsurance contract. 8. Bala Kailasam Memorial Award (BKMA) has been recently given to ___________ for his/her Assamese documentary Loralir Sadhukath. Explanation: The Bala Kailasam Memorial Award (BKMA) was given to Mukul Haloi, for his Assamese documentary Loralir Sadhukatha, on Saturday at the NFDC Tagore Film Centre. The documentary, which has been scripted, shot, directed and edited by him, was previously screened at several film festivals including the Mumbai Film Festival 2018. Loralir Sadhukatha, which translates to tales from our childhood, attempts to recollect and present the lives of people in 1990s Assam, amidst the conflict and violence with the presence of the army and the United Liberation Front of Asom (ULFA). 9. According to the recent government’s decision, the women will be inducted in a graded manner to eventually comprise ____ per cent of total Corps of Military Police of the Army. Explanation: Defence Minister Nirmala Sitharaman cleared the decision to induct women as jawans in Corps of Military Police (CMP) in Army. The women will be inducted in a graded manner to eventually comprise 20 per cent of total Corps of Military Police of the Army. Sitharaman said that a ‘historic’ decision has been taken with an aim to ‘enhance their representation’ in the armed forces- news agency PTI reported. 10. Uttar Pradesh cabinet recently approved the proposal of renaming the Mughalsarai tehsil after _____________. Explanation: The Uttar Pradesh cabinet approved the proposal of renaming the Mughalsarai tehsil as Pandit Deendayal Upadhyay, the co-founder and president of Bharatiya Jana Sangh. Many places in the state have witnessed change in names in the recent past under Chief Minister Yogi Adityanath-led Uttar Pradesh government. In August last year, the iconic Mughalsarai Railway station got officially renamed as Pandit Deendayal UpadhyayJunction. On October 16 last year, Allahabad was formally rechristened to Prayagraj. Both the Centre and the state government have drawn much flak from the opposition for the renaming spree. 11.The Oder–Neisse line is the basis of the international border between ________ & __________. 12.Naval Science & Technological Laboratory (NSTL) organized the NSTL – Academia Meet (NAM 2019) with the theme ________________. Explanation:Naval Science & Technological Laboratory (NSTL) organized the NSTL – Academia Meet (NAM 2019) at Mohapatra Manasi Auditorium, NSTL on 19th January 2019. With the theme “Artificial Intelligence for Naval Systems”, NAM 2019 provided the ideal platform for deliberation and discussion on the topic of Artificial Intelligence (AI) and its application to defence systems, with specific emphasis on naval systems. A galaxy of researchers and faculty from 18 Universities, technologists and system developers of six labs of the DRDO – NSTL, NMRL, CAIR, NPOL, DMRL & DEAL actively participated in the meet and exchanged views and ideas in the exciting area of research – AI. 13. Prime Minister Modi inaugurated the National Museum of Indian Cinema in ____________ recently. Explanation: Prime Minister Shri Narendra Modi inaugurated the National Museum of Indian Cinema in Mumbai. The Prime Minister took a tour of the Museum, after which he addressed a gathering of the film fraternity. Speaking on the occasion, he congratulated everyone for the inauguration of NMIC, which he said showcases the entire history of Indian cinema in one place. He also congratulated the film fraternity, under whose guidance Indian cinema has been continuously making new strides. 14. ___________ has recently resigned as Chairman of The Energy Resources Institute (TERI). Explanation:Former finance secretary, Ashok Chawla, has resigned as Chairman of The Energy Resources Institute (TERI). Mr. Chawla had replaced B.V. Sreekantan Nair as the Chairman in February 2016. Mr. Nair resigned following a change in the council’s leadership in the aftermath of the resignation of R.K. Pachauri, who was asked to stepdown after charges of sexual harrassment. 15. Who will be the new Chief Information Officer and spokesperson of the CBI? Explanation: Senior Indian Information Service officer Nitin Wakankar will be the new Chief Information Officer and spokesperson of the CBI, replacing Abhishek Dayal who has been transferred to the Publications Division. The change in the agency comes close on the heels of removal of Alok Verma as the director of the Central Bureau of Investigation by a high powered selection committee.